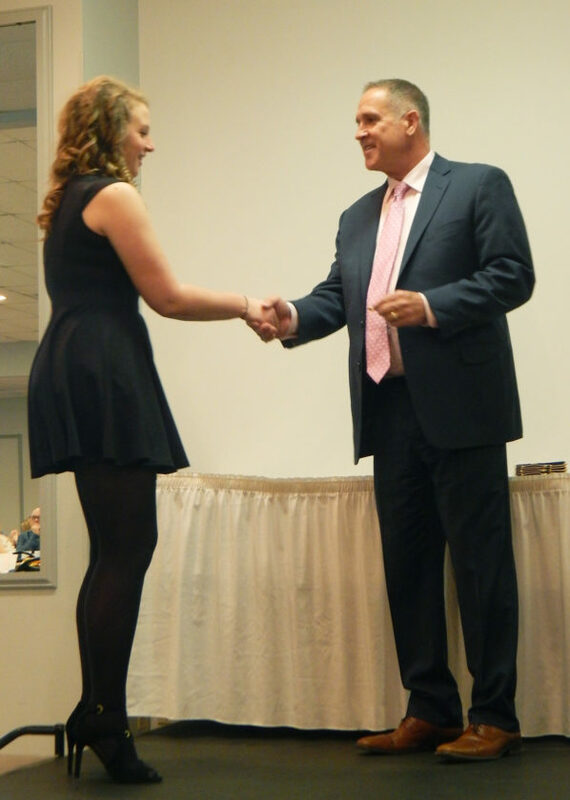 PHOTO BY NICOLE WALBY Senior Alice Demith (left) receives recognition from Superintendent Gary Barber for the third year during the Columbian High School Academic Letter Breakfast Wednesday at Camden Falls Reception & Conference Center. A former high school teacher talked about the importance of hard work, not only in school, but also in play, Wednesday morning. More than 120 students — sophomores, juniors and seniors — were recognized for having grade point averages of 3.5 or higher for three, five or seven semesters. Deb Baker came to Tiffin in 1985 as a part-time Columbian High School English teacher and retired in 2015. She returned for the 2016-17 school year. Baker said it is not only work students must concern themselves with, but also play. Baker said she knew students were there due to perseverance and commitment to good study habits and hard work. Play also is essential to a developing brain, Baker said. Baker said it is important for students to set time aside for a play date with themselves once a week, even if they feel they are too busy. The criteria are to do something not required, such as sports or practicing a musical instrument; do the activity alone, to have a “restorative break with others”; and to get away from phones and other electronic devices. “You have to have time to daydream,” she said. Many are focused on being busy and accomplishing things that need to get done, Baker said. Baker said it is crucial to set time aside for ourselves. “I want you to keep working hard, but also make time for play,” she said.